I’m preparing for my 4th Kindergarten student, and I’m looking forward to our fun year together. My little student is excited to learn more math and is asking daily to learn to read. She is very ready to join our homeschool. 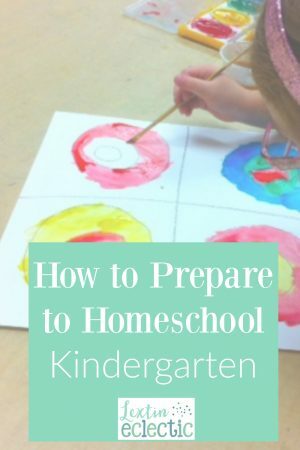 As I get ready for our next school year I’ve looked back over my Kindergarten plans and thought about our homeschooling philosophy for the K year. My reflection helped me organize our priorities and set our plans for a new year. Here is a little of my advice for those who are also planning a Kindergarten year. Kindergarten kids often have a short-attention span and don’t need (or want) to be sitting for long periods of time. Therefore, keep your seat-work time to a minimum. With my K students I don’t spend more than 45 minutes of “sitting down” learning during our day. My Kindergarten kids need to have frequent breaks to play and explore. I try to plan two separate sessions in which we work on their school subjects. I also plan another time, usually later in the day, to read aloud to them. The time in between our formal school sessions is left open for play. I find that short and focused learning times with frequent breaks work best. I’ve learned that my kids need to know what to expect during our school days. They like to know when they have a scheduled time with me and when they will have play times. To help them, I create a schedule that guides our day as we work through our school subjects. I’ve found that my kids complain less and have a more willing attitude to complete school work when they know that school is scheduled into our day, but also that play is scheduled as well. In our homeschool I focus on learning to read as the first priority. I follow the pace of each child and we work on reading skills daily. Reading is a priority before handwriting, spelling, science, history, and even math. I also prioritize a read-aloud time so that I can share wonderful literature with my small students. If we have a busy day and there is only a small window of time to spend with my K student, I make sure that it includes reading. Young children learn best when they can interact with the topics that they are learning. This is why I use math manipluatives, alphabet letter tiles, and games when I teach Kindergarten. I’ve found that making the learning more kinesthetic works well when my kids are young. I may not do many in-depth activities and craft projects, but I make sure that our core subjects have simple hands-on elements. I also use very few worksheets and require very little writing of my K students. My Kindergarten students have daily school time with me in which we cover reading and math. However, this is only a small portion of their overall day. I choose to focus on play time – both structured and unstructured. We often play games together but I also encourage my children to explore and play on their own. Of course, outside playtime and park days are also important in our homeschool. In the early years, I know I’m laying a foundation for later learning. Therefore, I prefer not to rush my Kindergarten students as they begin learning the basics. I repeat lessons as often as necessary. Sometimes we cover one lesson over multiple days. I am focused on building a solid foundation through mastery learning. If lessons take longer than planned and curriculum is carried over into 1st grade, I understand that this is part of learning well. As I plan our Kindergarten year and choose curriculum, I have my eye on the future. I am aiming for an independent learner who has a solid foundation in the basics. Therefore, I focus on teaching good habits during our K year. This includes a focus on responsibility, a structured but very short school time, instruction in simple household chores, and an emphasis on reading while building an enjoyment for good books. Kindergarten at our house is the beginning of more formal learning. Yet, I’ve learned that it’s important to have age-appropriate expectations of little learners. I adjust the pace of our learning as necessary to fit the needs of each of my young learners. Also, I try to avoid over planning and over scheduling, leaving an abundance of time for play. The Kindergarten year is just the beginning of a learning journey. The emphasis should be on simplicity and fun while maintaining a consistent routine. I always enjoy looking back on each Kindergarten year and seeing how far my little learners have come while still maintaining their enjoyment of learning.